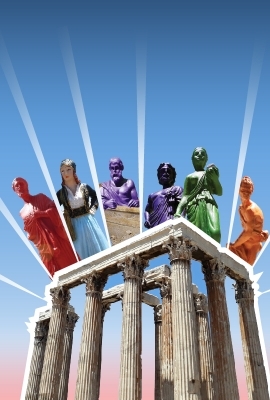 An alternative self-guided audio walking tour in the rebellious Exarcheia neighbourhood of Athens, with credible & original stories written by top local professionals. Take your tour now & enjoy it instantly on your smartphone device. Exarcheia, a hidden gem in the heart of Athens invites you to a place far removed from the tourist predictability to be found in more popular spots. Exarcheia is much more that the “rebellious” area of Athens so frequently covered by the media. It is a colourful, lively and active district that preserves its neighborhood character with an admirable dedication. But the only way to feel this is by walking through its quintessential hangouts and become familiar with the stories and the memories shared by the locals. Exarcheia Square is the obvious point for a first and good introduction to the feel and spirit of this neighborhood. It is defined by two landmarks: the Three Cupids’ statue and the Blue Apartment Building. The latter was built in the 1930s by a pioneer of the Greek modernist movement. It became famous for the vibrant blue colour of the exterior walls. Today it may have faded but the memories and the stories of the people who lived here are alive and well. Themistokleous Street hosts cafes, bookstores, apartment blocks dating back to the days of WWII, summer cinemas, theaters, social spaces, etc. 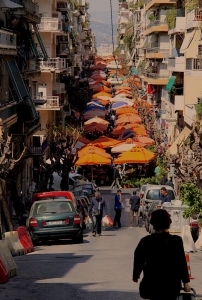 It ends on Kallidromiou Street, one of the most picturesque streets of Athens that is transformed each Saturday morning with the colours, fresh smells and fragrances of the local produce street market. A short walk will bring you to Strefi Hill, offering an unimpeded view of Athens all the way to the sea. In December 1944, the leftist forces of ELAS placed two small cannons here and shelled downtown Athens. Valtetsiou Street is home to two culinary institutions: “Rosalia” tavern was built on the spot where at one time stood the house of Augusta, a woman with such horrifying looks that, during the Nazi occupation, mothers would threaten their children she would come for them if they did not eat their food. After her disappearance the neighbors found out that she was an active member of the Resistance. And on a hot summer night could you think of anything better to do than sipping a cold drink while enjoying a movie? In the “Riviera” open-air cinema you eat snacks, drink refreshments and watch movies sitting in a verdant courtyard. Mesologgiou Street will be forever associated with Alexis Grigoropoulos, a young student murdered by a police officer, a crime that sparked the riots of December 2008, a prelude to the ongoing Crisis. As you make your way towards the National Archaeological Museum, it would serve you well to remember that Exarcheia is a place where everything is possible. You can even see Lady Gaga standing at the “Music Machine” music store, sticking an autographed poster of her new record on the shop window. "The blue Building” was well known in the ‘40s. 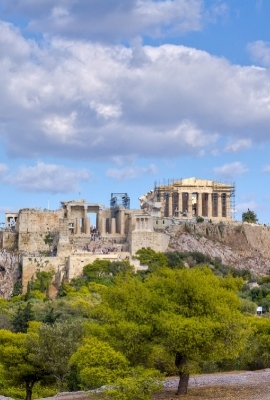 It was so big that it could be seen from Lycabettus hill. 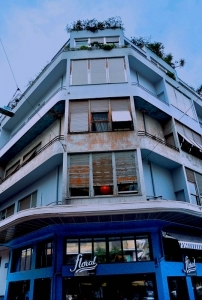 It had an intense dark blue color, which stood out from far”, says Ms. F.
Beginning at Asclepius street and ending up on Spyridonos Trikoupi street, Kallidromiou is a main road crossing almost all of the Exarchia neighborhood, creating a boundary separating it from the nearby Neapolis area. 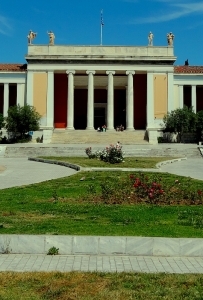 The National Archaeological Museum is one of the first museums established in the country, it is the largest museum of modern Greece and one of the greatest in the world, particularly in the field of classical studies. The Swiss architect Le Corbusier, in Athens for the Fourth International Congress of Modern Architecture, visited the Blue Building while still under construction. He was so impressed that he wrote on the entrance: «C'est trés beau»: It is beautiful. Le Corbusier was one of the pioneers of the modernist movement, with works in Europe but also India and the USA and Russia. The most characteristic building of his work is Villa Savoye at Poissy in Paris. "Stella, I am holding a knife ..."
The epilogue of the legendary film "Stella", directed by Michael Cacoyannis, starring Melina Mercouri and Yiorgos Fountas, was filmed in Kallidromiou street. Stella, like Carmen, facing the dilemma “slavery or death” decides to die and lets herself be killed by her lover and prospective husband. He on the other hand, succumbing to the morals of Greek post-war society, defends his honor as a man by killing the woman he loves. A tragic love story, almost an ancient greek drama epilogue. The premiere of the film was held in 1955, at Cannes Festival, where both the film and the protagonist were nominated for the Golden Palm. One year later the film won the Golden Globe in the USA. Six months before the invasion of the Nazi army in Athens the authorities decided to hide and protect the museum exhibits from damages, loot or theft by the enemy forces. 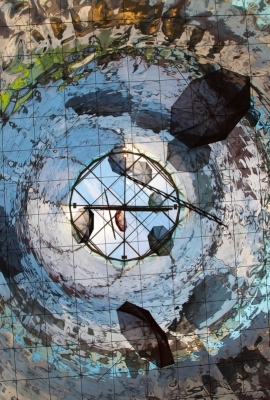 Large pits were dug under the Archaeological Museum, where the exhibits were buried "like dead bodies", while other objects were moved to various shelters and the basements of the Bank of Greece. The urban legend goes that some of those antiquities are still buried … Could they perhaps be the surprise awaiting archaeologists of the future? Diadrasis is a nonprofit organization based on the idea of progressing and developing Conservation Science through the meeting and interaction of different cultures and specializations. Non-formal training, research, publications and awareness.